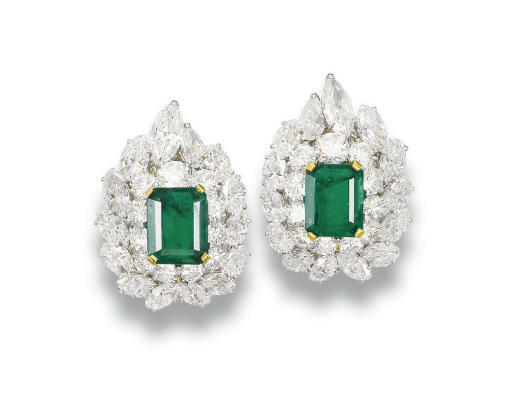 Historically mystical and alluring, with a ripe past steeped in folklore and symbolism, emeralds have been long known and revered. Originally mined in Upper Egypt, in an area known as 'Cleopatra's Mines', with early known deposits in the Urals and India, it was not until the Conquistadores entered the New World that trade routes were developed between Europe and the unrivalled Colombian emerald mines, affording the rest of the world the purest gem-quality material. The finest bluish-green gems combined with the deepest colour saturation and clearest composition, Colombian emeralds are still today the most sought after. Outstanding emeralds feature within this beautiful collection of early Bulgari jewels and exemplify the fabulous decorative use of emeralds within the art deco period. Dating from the 1920s and purchased by the family directly from Bulgari. Not only are these jewels wonderful examples of strong art deco style, using coloured stones to enhance both design and value, but their condition is almost perfect, having been stored in a bank vault for a number of years.